Decision-makers at University of Nebraska Medical Center appreciate Marshall Furniture Marshall ARCO lecterns for durability & mobility. 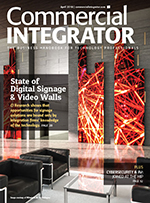 Nothing makes an integrator happier than when the planets align during an installation — solid products, seamless ordering, and a satisfied customer. Trent Burnison, a design engineer from AVI-SPL, recently had that experience with Marshall Furniture for an installation at the University of Nebraska Medical Center, in the Truhlsen Center. 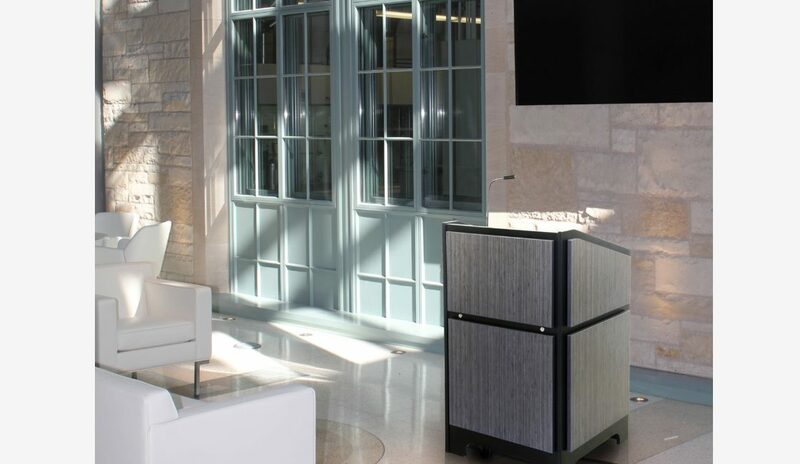 Burnison, who was hired by the university to select and install the perfect solution for speaking events and presentations, said that going with four of Marshall Furniture’s new Marshall ARCO lecterns was a no-brainer. The Truhlsen Center serves as a conference center for both internal and external users. It’s furnished with virtual reality and video applications, as well as simulation labs and classrooms for the university’s medical students. It can seat up to 200 people, and can be broken down into multiple rooms or built up into one large room. However, whether it’s being used for a party or speaking event, the Truhlsen Center needed flexible lecterns to accommodate the space. “I hadn’t seen Marshall Furniture’s podiums before, but just from seeing the lines that they have, I thought we could find a good fit,” Burnison said. What sold decision-makers at the University of Nebraska, Burnison said, was the product line’s ability to withstand wear-and-tear, and time. Once the Marshall ARCO lecterns were ordered, it was all-uphill from there. A key part of the installation success was owed to Marshall Furniture’s ability to ship the Marshall ARCO lecterns quickly; Burnison and his team had the furniture ship within 10 days of ordering them. Having the solution at the ready within days of ordering it — instead of weeks, or in some cases, months — is a rare occurrence for the AV furniture industry, and was instrumental to making the installation team’s job easier. 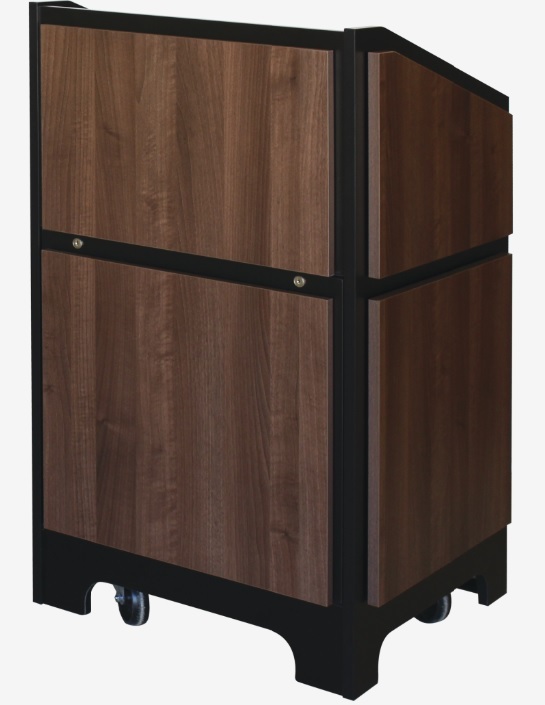 Burnison said that one of the hardest parts about designing lecterns is that they are usually the last item decision-makers think about during a project installation. “They talk about it internally, they think about it, what the color will be like, so they micromanage it,” he said. Marshall Furniture’s quick turnaround time enabled Burnison and his team to have the lecterns ready during the final stages of the overall installation. Because of that, they were able to train end users how to use the solutions, and hand over the controls immediately. Submitting the order was just a matter of checking off a handful of boxes based on how Burnison wanted the solutions to look and function, and providing an item number. Account executive Michelle Wille got in touch with Burnison and provided him a PDF of the exact lectern he wanted for the Truhlsen Center. Burnison then received a proof sheet of how the lectern was going to be constructed, from its dimensions to its finishes. From there, Marshall Furniture kept in touch with him during key intervals of the delivery, from the start of the build to the shipping date. Once unwrapped, the ARCO lecterns’ sharpness and versatility shone through. Burnison and his team installed four Marshall ARCO lecterns — one large one and three smaller ones. The lecterns came built with shelves, one of the many internal configurations available, to best serve the University of Nebraska’s needs. The large lectern was also built with a front and rear door for easier serviceability. “A rear service door was a standard feature for all these lecterns, which is ideal so you can work on the equipment without having to reach your hands inside the lectern, which is really nice,” Burnison said. Burnison noted that the lecterns could have been fitted in numerous other ways. “It could have come with racks,” he said. “If we needed it mounted, we could have gotten it with rack kits, or with fans or power strips. There were tons of different options,” even with finishes, handles, and more. Plus, all four of the ARCO lecterns will be able to be wheeled anywhere, can go to any of the 13 floor boxes in the Truhlsen Center. Once each one is in place, they just needed to be plugged in, and will then work within the system. “With the smaller lecterns [for example], I used equipment that is power-over-Ethernet powered (POE) so you don’t have to plug in a power strip or provide power to it,” Burnison said. Aside from working well in the space, Burnison said that one of his favorite features of the Marshall ARCO lecterns was their ability to blend well within the Truhlsen Center.